Ice-T, pioneering West Coast rapper, singer and actor, was born Tracy Marrow in Newark, New Jersey to Solomon and Alice Marrow on February 16, 1958. The Marrows were a working-class African American family who lived in the predominantly white town of Summit, New Jersey, where Ice recalls no memories of any overt racism or prejudice as a child. When Ice was in third grade his mother passed away suddenly of a heart attack, and four years later, his father died the same way. As an only child, he was sent to live with an aunt in South Central Los Angeles, California following his father’s death. As a student at Crenshaw High School in the mid-1970s, Ice became interested in the writing of the author Iceberg Slim and developed a reputation for memorizing and reciting passages from Slim’s books to his friends. During this time street gangs like the Crips and the Bloods began to emerge in Los Angeles, and Ice started to write ‘street’ rhymes which he would perform years before rap became known. After graduating from high school Ice joined the Army and was stationed in Hawaii. While he was there he heard the landmark rap single “Rapper’s Delight” by the Sugar Hill Gang and was drawn to the connection between his own street poetry and this new style of music. After his discharge Ice returned to Los Angeles and briefly flirted with the hustling lifestyle before getting serious about music. He first gained notoriety with his song “Reckless,” which appeared on the soundtrack for the 1984 film Breakin’. Then in 1986 he recorded “6 ‘N The Mornin’,” widely considered one of the first ‘gangsta’ rap records. These early hits—combined with his debut album, 1987’s Rhyme Pays, and his performance of the title song for the Dennis Hopper-directed film Colors about LA gang life—helped Ice-T become the first West Coast rapper to achieve national fame. As the lead singer for his heavy metal band Body Count, Ice recorded “Cop Killer” in 1991. The song was controversial and drew condemnations from police guilds and the National Rifle Association for allegedly inciting violence against police officers. Ice-T was able to leverage his popularity and visibility into a leading role as Detective Scotty Appleton in the 1991 Mario Van Peebles movie New Jack City. He would go on to have major parts in numerous other films including Ricochet (1991) alongside Denzel Washington, Trespass (1992), and Surviving the Game (1994). 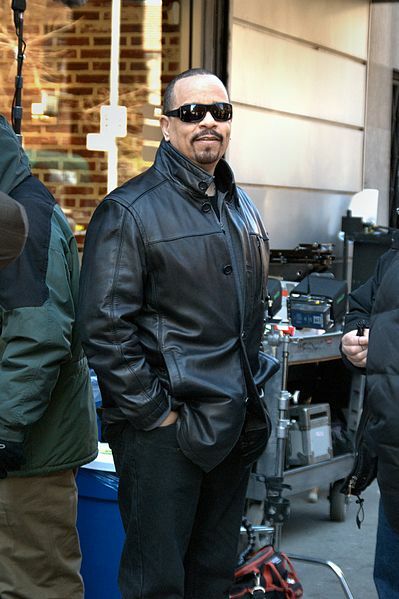 In 1991 Ice-T won a Grammy Award for Best Rap Performance by a Duo or Group for his collaboration with Melle Mel, Kool Moe Dee, and Big Daddy Kane on the Quincy Jones song “Black on the Block.” After a number of recurring roles on several different television series, Ice was cast as Detective Odafin Tutuola on NBC’s Law & Order: Special Victims Unit in 2000. For his work in television he has won NAACP Image Awards for Outstanding Supporting Actor in a Drama Series in 1996 and 2002. Ice has two children, daughter LeTesha (born 1976) and son Tracy Marrow, Jr. (born 1992). On December 31, 2005, he married swimsuit model Nicole “Coco” Austin. Ice-T and Douglas Century, Ice: A Memoir of Gangster Life and Redemption-from South Central to Hollywood, (New York: Random House, 2011); Daudi Abe, 6 N The Morning: West Coast Hip-Hop Music 1987-1992 & the Transformation of Mainstream Culture (Los Angeles: Over The Edge Books, 2013).